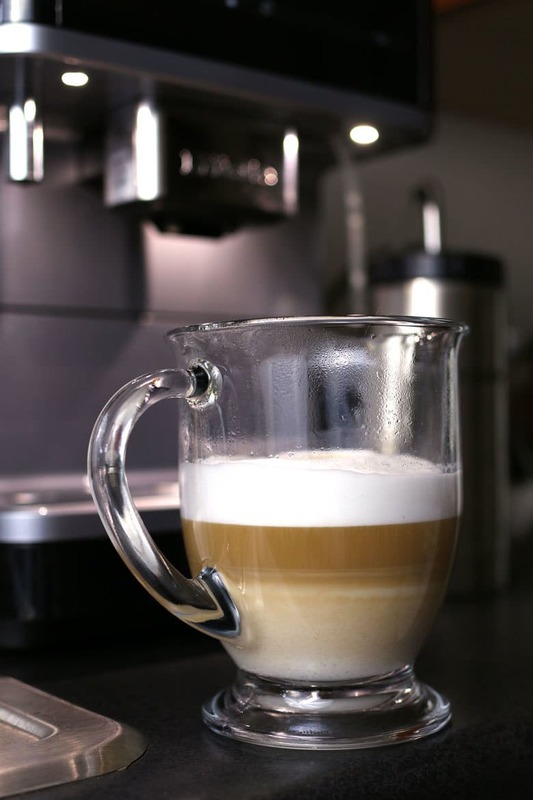 There’s nothing better than morning’s with a great cup of coffee, Make yourself a cafe latte with the Miele CM6 and a big batch of some scones! I took a moratorium on vanilla lattes a few years ago. It literally was years before I had one again on my trip to New York City with Miele. One sip of that latte had me begging for more. Then Miele offered to send me one of their CM6 fully automated espresso machines and the rest is history. I also took a moratorium on product reviews but this espresso machine is so amazing that I had to make an exception. I loved every Miele product in their showroom but this particular product called to me for a few reasons. Two, it creates an amazing cup of coffee. My husband and I have both agreed that it makes the best coffee we have ever had. I was sold back in New York but to give an honest review, I have been using the Miele CM6 (affiliate link) for awhile so I could tell you all of the great things it’s got going for it. You can use both whole coffee beans and ground coffee. That’s a plus in my household because my husband and I love french roast but our family doesn’t. Beans for us, ground coffee for them. 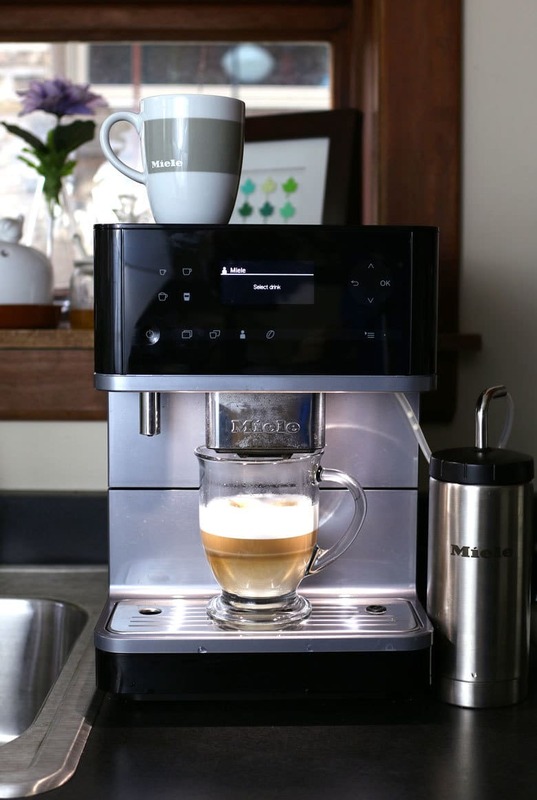 It makes espresso, coffee, a variety of different coffee drinks and you can change all of the settings to add a little extra water. Or a little more coffee. Or whatever you want; it’s that cool. Also, you can save your settings so if you like your espresso one way and your spouse likes theirs another way, you can save both. Just touch a couple of buttons and you have your perfect cup of coffee. For those that like drinks with milk, it has an attachable milk container. I used to work in a coffee shop and frothing milk for lattes was a pain. Now, with the Miele CM6, its literally as easy as touching a button. I teach cooking lessons to my 11-year old neighbor and she always asks me to steam and froth some milk for her. She waits and watches the froth come out. And, when it comes time to clean the machine, it lets you know. Whether it’s descaling, cleaning the milk tube, or cleaning the whole machine – the machine tells you on it’s display. THE MACHINE TELLS YOU. 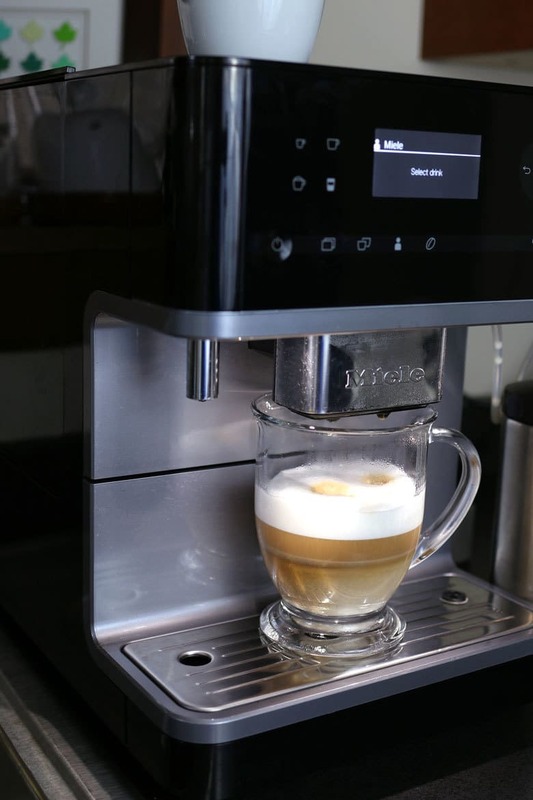 So, the next time you are looking to add an espresso machine to your kitchen appliances, get the Miele CM6. Come over to my house and sample some of it’s coffee and you’ll be sold too. Grab a latte and then make yourself some some of these blueberry chocolate scones. A good cup of coffee and a great scone make me a happy girl in the morning. That coffee machine looks life changing!! I can’t think of anything better than a scone and anything from that machine! Umm, reading your review of the Miele makes me want one. Because HOMEMADE LATTES sound like the best idea I’ve heard in a long time. 😉 So happy you’re getting to use that for yourself! And these scones – yum! What’s not to love about the blueberry/chocolate combination? What a FUN espresso machine! I’m in love with it….and with these delicious scones! The perfect combo! Gosh, I think I need a Miele and pile of these scones! Great christmas gift idea! I’ll take a scone AND an espresso machine – a winning combination, for sure!